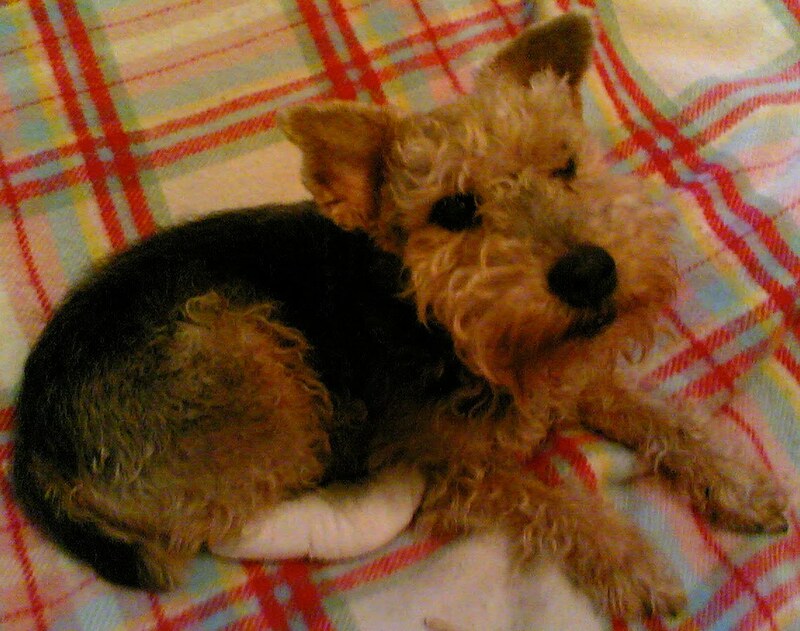 Outright Ingrate: The tyranny of the terrier. I know this routine all too well. We have had 3 terriers who lived past 13 & they all gave going for a walk. Larry, age 13 now, wakws us up at sunrise (which is 5am now) & demands to be fed. He will pick up his dish & drop it or stand on the bed & make peculiar moaning sounds. I give up, make tea & then feed both dogs... then Larry goes directly back to bed. The girl dog is too cute to believe. I want to eat her up. 5 am!! I administer the bedtime snack to avoid that sort of incident. I think Larry's moaning is probably a similar routine to the funny noises she makes. Not quite a whine, but a growly heavy-breathing sound. Once you've been bossed around by a terrier, I think you're under their spell forever. I cannot get "God Loves A Terrier" Out of my head. And WHY would I want to?